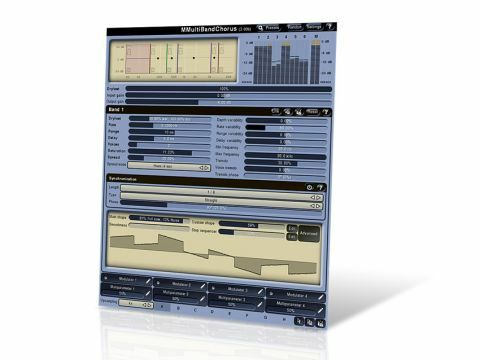 Multiband chorus might sound crazy, but MeldaProduction have proved that the concept is sound with this great plug-in. Superb, highly adaptable sound. Unique multiband functionality. Great modulation options. Deep level of control. It's not often that we see a worthwhile new spin on an established effect, but MeldaProduction's MMultibandChorus is just that. It utilises up to six fully adjustable bands, each being essentially a separate chorus effect working on a specific frequency range. On first loading the plug-in, a single band covers the entire frequency spectrum, so it works like a standard chorus. Each band can produce between one and ten voices (higher values give increasingly synth-like ensemble/ unison effects), and MMBC has a variety of Spread modes to give stereo width: panorama, which pans the voices; phase, whereby the phase of each voice's modulation LFO is offset between the left and right channels; and 2, 4, 8, 16 or 32ms Haas, which offsets the channels with a short delay. The latter is our preferred choice for thick, analogue-style chorusing. Clicking a band brings up its settings, and each one can be muted or soloed as required. MeldaProduction has done an excellent job of providing comprehensive per-band chorus control, and as well as the usual suspects, such as rate and depth, you can also tweak the variability between voices for many parameters. There's even a low-/high-pass filter that can be applied to the wet portion of each band. Each band has its own LFO, with a rate ranging from 128 to 1/128 bars, in straight, triplet and dotted rhythms. There's a huge variety of LFO shapes, including standard sine, square and saw waveforms, as well as exponential and 'mess' (a sort of noise), and you can smoothly sweep between one shape and the next. The Advanced settings window lets you dial in custom wave shapes - advanced stuff indeed! We found MMBC to be highly useful on synth sounds, especially basses, as you can leave the lower frequencies chorus-free, thus avoiding bass phasing issues, while spreading the upper frequencies to create a wider stereo field. The built-in per-band tube saturation, meanwhile, provides warmth or, if pushed, grit. Chorused clean guitar is a classic sound - think Kurt Cobain or Johnny Marr - and MMBC excels at creating shimmering axe tones. You can easily add subtle modulation to specific frequency ranges, or have each band operate independently for true modulation mayhem - even the band crossover points can be modulated! Indeed, experimentalists should take note, as more extreme settings can give rise to some weird modulating 'microdelays' and IDM-esque glitchiness. There's a dazzling array of options that can be accessed via the Settings button at the top right-hand corner. For example, you can choose between Analog, Linear-phase and Hybrid crossover algorithms; higher-quality upsampling (which comes at the expense of an increased CPU hit); and whether you want MMBC to process mono, stereo or surround signals. With the latter mode engaged, the plug-in takes input from up to eight channels, which should pique the curiosity of film, TV and videogame composers. You can also resize and recolour the GUI to your liking. If inspiration is running low, you can hit the Randomize button to generate new settings, and holding Ctrl while doing this will only subtly change the parameters, which is a nice touch. You can also morph between four sets of settings using the ABCD strip at the bottom of the interface. At first, we were sceptical of the concept of a multiband chorus - it almost seemed that MeldaProduction had created one purely for the sake of it. In use, however, MMBC immediately proved to be more than mere novelty, due to its ability to precisely target the frequencies to be chorused, thus gaining shimmer or stereo width only where needed, while retaining solidity elsewhere. It's simply a great-sounding, inspirational effect, and at this price, it's impossible to rule out MMBC if you're in the market for a new chorus unit, since it can do everything from traditional analogue wobbling warmth to completely screwed-up craziness.